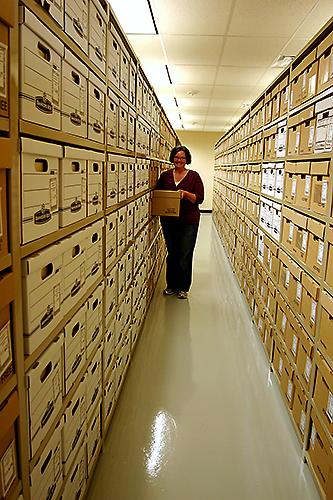 In the controlled environment of the Archives' new Storage Room, Christina Wolf examines a box of historical church records. You feel goosebumps rise. Yes, the room temperature is in the low 60s. But the cool environment is not causing you to quiver. Christina Wolf takes a box from a shelf, lifts the lid, and reveals an Oklahoma treasure. You understand those goosebumps. This history lives on today in you. The 168th annual conference meets this year. This Journal is among precious artifacts carefully stored in the Oklahoma United Methodist Archives, housed in the OCU Library. Some brand-new upgrades enhance the preservation of these important keepsakes. A major renovation of the library’s fifth floor, including the archives, has just been completed. Archivist Wolf and her staff will host an open house for delegates and other visitors during the 2011 Annual Conference. The archives have gone "green." Guests will note the fifth floor has been reconfigured. New group study rooms are wired for electronic presentations, and a large Honors Seminar Room is where Wolf offers workshops in historical research and preservation. The Archives Reading Room features low-energy, longer-lasting LED lighting. The biggest changes, however, are in the extensive Storage Room. Access is through an unremarkable door, with an electronic keypad. The archives’ security system is "our first line of defense," Wolf said. Inside the Storage Room, the temperature drops noticeably. A new, separate HVAC system maintains it at 62 degrees. Humidity also is monitored, programmed for a 45-50 percent range. The fluorescent lights are sheathed with UV-blocking material, and only used when someone is in the space. Special blackout material covers the windows. "Happy records are cold and dark," Wolf said. "We’re mostly paper here. Light damage makes paper brittle, yellow; and light damage is cumulative." Carpet is absent. Instead, the Storage Room floor is a special gray epoxy surface, swept and mopped weekly. Carpet manufacturing uses chemicals that can cause the product to release damaging off-gases. Even carpet fibers in the air can be abrasive to the artifacts, Wolf explained. Baked enamel coats sturdy shelving units—wooden shelves also emit off-gases, she noted. Storage boxes and folders are acid- and lignen-free. "The goal here is to make it last," Wolf summarized. An additional Processing Room is similarly designed to maximize preservation work. The Oklahoma Conference Council on Finance & Administration approved funds to partner in the remodeling. The funding support was requested by the Commission on Archives & History, chaired by Jerry Gill of Stillwater. The Archives shelter records of local churches as well as the Oklahoma Conference. The facility also houses early railroad maps, Civil War letters, original sheet music, and rare books that include an edition of Shakespeare’s works. Among the rows of shelving, too, are records of the Oklahoma Indian Missionary Conference and OCU’s archival records. Recently added is the collection of the late Ted Agnew of Stillwater, whose passion for history was highly valued in the Oklahoma Conference. Wolf said Agnew’s materials fill about 150 boxes. Hours for the open house during Annual Conference will be 7:30 a.m.-6 p.m. Tuesday and Wednesday. The Annual Conference luncheon for the Oklahoma United Methodist Historical Society will be Wednesday, June 1. Contact Wolf to reserve tickets. On July 21-24, OCU will host a national Archives & History event.